For hole openings that are no greater than 3/4"
Distance between holes: 1 3/4"
NOTE: For covers other than Leer these latches may be opposite. Please confirm correct latch with the picture above. 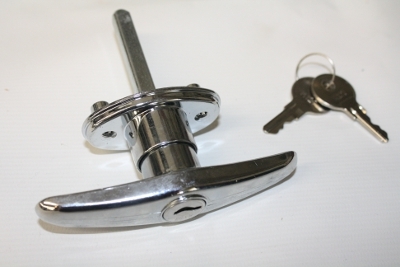 Description: Push Button Lock Trigger works with the Push Button Lock to release the tonneau cover or truck cap door. If ordering two of this item please select one left hand and one right hand. ** Fiberglass, Aluminum, and Steel Truck Caps and Fiberglass Tonneau Covers (lids) are not UPS-able/FedEx-able and therefore are available for purchase by local customers only. We have several other products not listed on our site. Please feel free to call with any questions. A Division of Bumgardner, Inc.